Cute rug. Color is nice. Does the job. 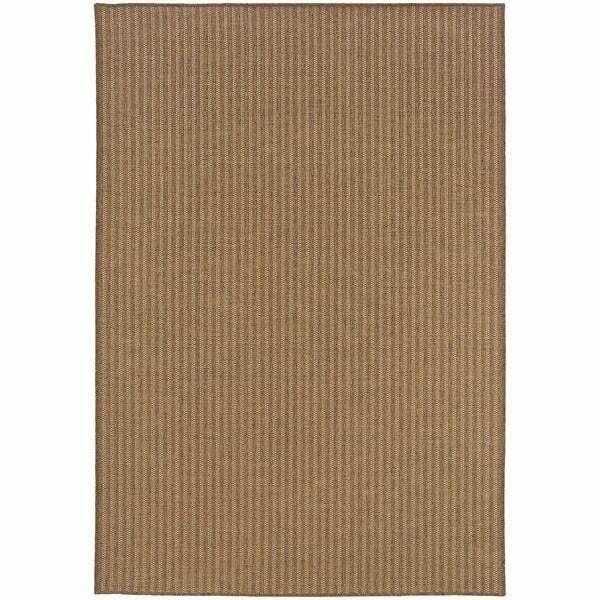 Add a lovely touch to any indoor or outdoor space with this tan area rug. With a durable construction, this area rug provides durability and will tie any space together. Dimensions 129.92 In. X 94.49 In. X 0.16 In. Quality rug at an excellent price. Highly recommend. The pattern and color were very pleasing. The weight was good. I like that the size was exactly the size stated. I love the color it is perfect for the office i also ordered every other size they had for purchase. This is a great buy for the price! I used this rug on our deck all summer. It still looks like new. I bought this rug for the patio and happy with it so far. When I opened it initially, the edges rolled up, but I laid it upside down and it straightened up in a few hours. Have yet to see how it withstands through the summer. Darker than pictured. Darker Stripes. Nice quality, hoses off and withstands weather very well. I would have liked it lighter, but it is neutral and looks great anyway. I would purchase again or recommend it to others. This is a very handsome, classy entry carpet. I like the subtle stripe in the sisal, gives it a designer feel! "Hello can this rug be easily rinsed off and will it dry fairly quickly? Thank you"
It will depend on the temperature outside. "Can this rug be easily cut?" Hello Qkadeby, yes, it can be cut but any alterations will void the warranty. Thank you for shopping with us!